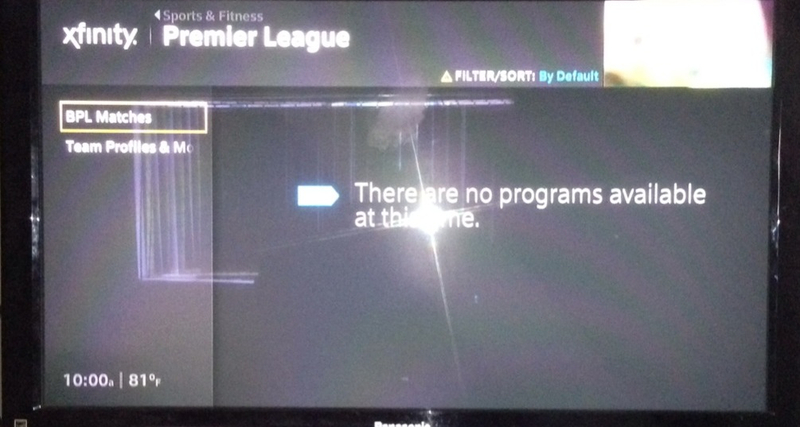 With the Premier League kicking off this past Saturday, Comcast were completely caught with their guard down. The rumors about Premier League Extra Time turned into stone cold fact. The above picture, which was the path to get into Premier League Extra Time on Comcast’s X1 platform, was taken on my iPhone right at 10:00 Saturday morning. As you can see, there were no live games available to watch. That meant that besides NBCSN, the only other way to watch games was though NBC Sports Live Extra. The online service, at least for me, worked flawlessly. However, for Comcast’s inability to get games live on Saturday morning, all Premier League Extra Time games were actually available on-demand by halftime of the Swansea City v Manchester United game. Comcast does deserve one bit of praise. Along with the games, they put MOTD and MOTD2 up on demand. Doing that allowed those who didn't watch live, or set up to record, to watch at their leisure during the week. Having spent all weekend watching games through my on-demand platform, I started compiling my own notes about what I would recommend changing. Below are the highlights of what I would recommend to Comcast for making our Premier League experience better going forward. 1) Comcast need to publicly apologize to those customers who did not even have Premier League Extra Time available to them. As of this writing, I have seen no formal communication from Comcast apologizing to their customers for making a mess of something that should have been easy to do. It wouldn't have been difficult for them to say they were sorry for not having PLET ready on day one, and that they were working double time to ensure PLET will be available prior to the start of this weekend’s games. The various time frames that I've seen online in the Comcast forum is simply inexcusable. It is too time consuming to apologize to customers one at a time. This would be one of the few times admitting that they got this wrong would make for some positive PR, instead of being thought of as liars. 2) Comcast should have ‘Premier League Extra Time Channels’ set up instead of having to access games live through the on-demand menu. To me, once PLET is available to everyone, this seems the easiest no brainer decision to make. They were able to set them up for the Olympics for the basketball and soccer competitions, so customers already know overflow channels can be done. They also need to use overflow channels because they as a company can only keep games up for a week. There are going to be fans who will want to DVR certain games to watch at their leisure. You can’t do that if you have to watch games going through the on-demand functions. While this last bit is my own personal preference, I want to be able to DVR these games so I have better use of the rewind/fast forward functionality that the X1 DVR provides. While I know I’m reaching on this last point, if Comcast continues to insist on PLET games live through the on-demand channels, it would make life much easier on the customer looking to watch those games to just be able to access the Premier League menu directly through the main on-demand screen. 3) When making games available on-demand, do not split the first and second halves up. The PLET games were split by half on Saturday, and the way they were split did not allow for any of the split first halves to be played past the 44th minute. Comcast is extremely fortunate that nothing happened late in those first halves. It would appear a lesson was learned, as the late game Saturday, and the game available on-demand Sunday was not split. Hopefully, that trend continues. In talking with a friend this weekend, they made an excellent point to me. Having these PLET games available quickly on-demand is as important as having the games available live. 4) Finally, the games need be better titled. Every single game available on-demand right now has the title of ‘Barclays Premier League Soccer’. How difficult would it be to make the title of each game the actual match being stored, with the description/info message being a quick preview of that actual game. It should be easier than it is to pick out a game and watch. Right now, you have to open each item individually to know which game, and segment of that game you’re about to watch. Comcast, as owners of NBC Universal own the Premier League rights in this country. While week one brought more growing pains than they would like to admit for their cable platform, making a few minor adjustments quickly will make a demanding public quickly forget how much of a joke this opening weekend was. If you are on Comcast, or any other cable platform, what changes would you make? Let me know in the comments below.